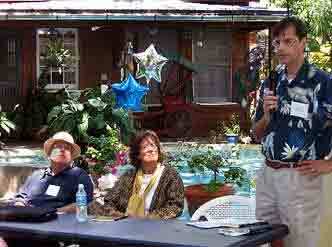 The 15th Annual Key West Robert Frost Poetry festival will be held in Key West, Florida April 15th - 19th, 2009 on the grounds of the Heritage House Museum, the Robert Frost Cottage, and select Key West venues. The festival will feature poetry and haiku workshops, poetry and haiku readings, art & film events and an international poetry and haiku contests. Featured poets are Dr. Michael Wyndham Thomas from England, Charles Trumbull, Lee Gurga, Rosalind Brackenbury, Barry George, Richard Grusin, Cricket Desmarais, Bob Muens, and Annette Basalyga. Poet Laureate Robert Frost was a frequent visitor to 410 Caroline Street and wintered from 1945 to 1960 in the 1834 garden cottage now known as the Robert Frost Cottage. The Key West Robert Frost Poetry Festival, started in 1994 by Jeanne Porter, is now an annual five-day celebration of poetry readings, workshops, award ceremonies, and related events. As such, the festival recognizes the esteemed poet and serves to encourage other poets who have been inspired by our island city. 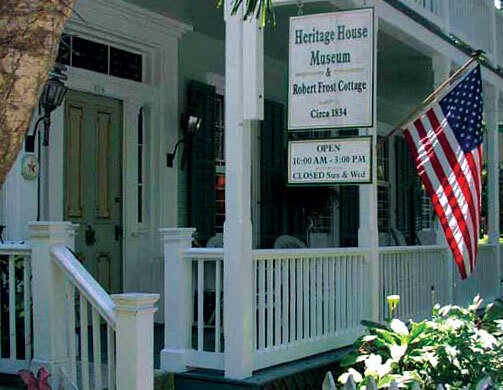 The Festival coincides with National Poetry Month (April) and is an ongoing endeavor of the Heritage House Museum to celebrate Key West as a literary destination. Participants in the Festival include Robert Frost’s granddaughter, Lesley Lee Francis, Richard Wilbur – a two time Pulitzer poetry prize-winner and former Poet Laureate of the Untied States, Judy Collins, Laurence Ferlingetti, Richard Grusin, Dan Gerber, Dr. Michael Wyndham Thomas, Rosalind Brackenbury, Lee Gurga, Kirby Condon, Charles Trumbull, and Rebecca Seiferle. In 1999, the Festival started its International Poetry Contest. The International Haiku Contest was added in 2005. Locally, Key West and Keys students compete in High, Middle, and Elementary School Contests.